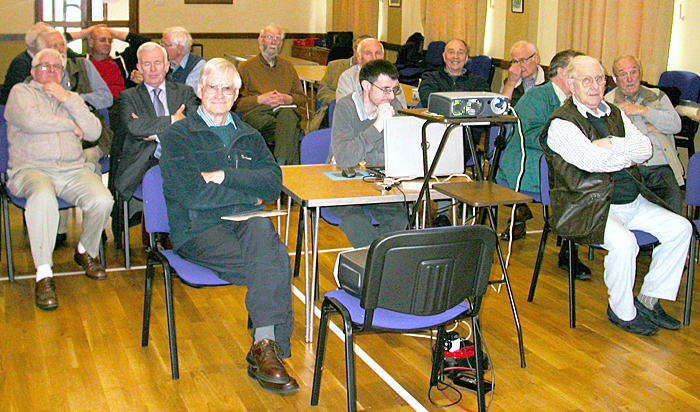 This meeting of the Postal Microscopical Society in the Village Hall in Pool in Wharfedale clashed with the Quekett’s Annual Exhibition, but still attracted a good crowd of microscopists with their exhibits and sales. 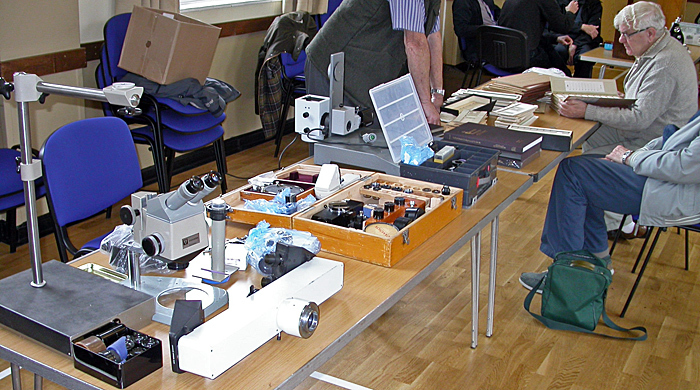 Peter Evennett and Chris Hammond had for sale a variety of microscopes and accessories on behalf of the RMS. Mike Samworth was offering items from the estate of Steve Edgar. Mike also used his recently-acquired American Optical AO 20 microscope to demonstrate relief contrast with 2 discs that may have been intended for a Leica inverted microscope. 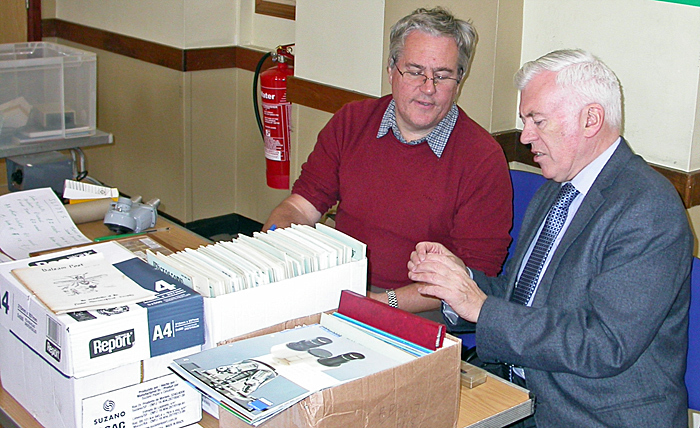 Mike Smith had a number of prepared slides for sale at £1.50 each, and was also selling Zeiss lens wipes. 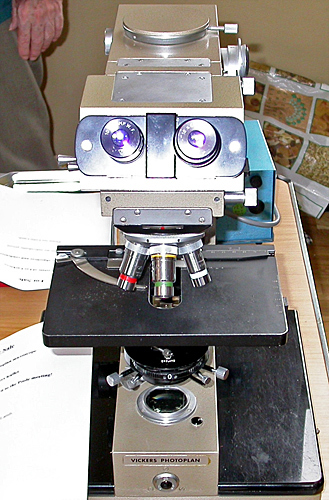 Colin Lamb was selling microscopes and accessories from the estate of Les Larkman, including a trinocular Reichert Zetopan with dark-ground and phase contrast condensers. 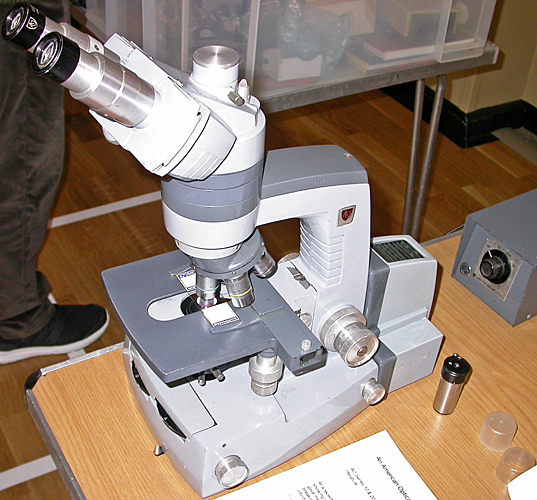 Colin was also selling a Vickers M41 Photoplan trinocular microscope. 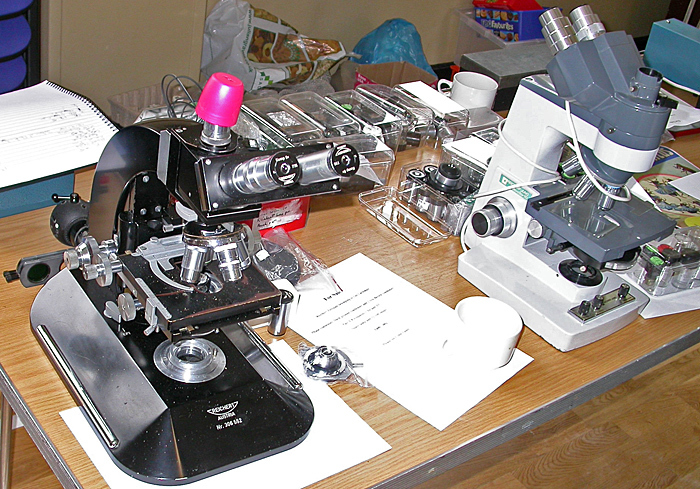 John Judson was selling a variety of items, and Headingly Microscopes were offering prepared slides at 20p each. Geoff Scordia and Andy Norman had numerous items for sale. After lunch there was a video of protozoa filmed in dark ground by Gordon Fitton. This surpassed his usual high standards.